Boozhoo - this is the Apostle Islands National Lakeshore (1970) - U.S. National Park Service - the lakeshore is located upon Lake Superior (the largest of the 5), at the very northern area of Wisconsin - Bayfield Peninsula, and the 21 sandstone islands of the glacial formed archipelago. These sedimentary sandstone islands were deposited during the late Precambrian era (around 600,000 million years ago) by northeastward-flowing braided streams. Subsequently during the Ice Age of the Pleistocene Epoch (starting about 2 million years ago), the Apostles were glaciated repeatedly, with the most recent glaciation by the Vanders Ice Lobe (around 12,000 years ago). Now with repeated weather and wave erosion, coupled with the winter season's frozen lake, streams and spring waters - you now have time sculpted geology coupled with seasonal ice formations - in the area of the indigenous Native American, Ojibwe or Chippewa people - the Red Cliff Band of Lake Superior Chippewa - only surpassed in population size by the Cree people in Canada. The Ojibwe call themselves "Anishinaabeg" which means the "True People" or the "Original People". 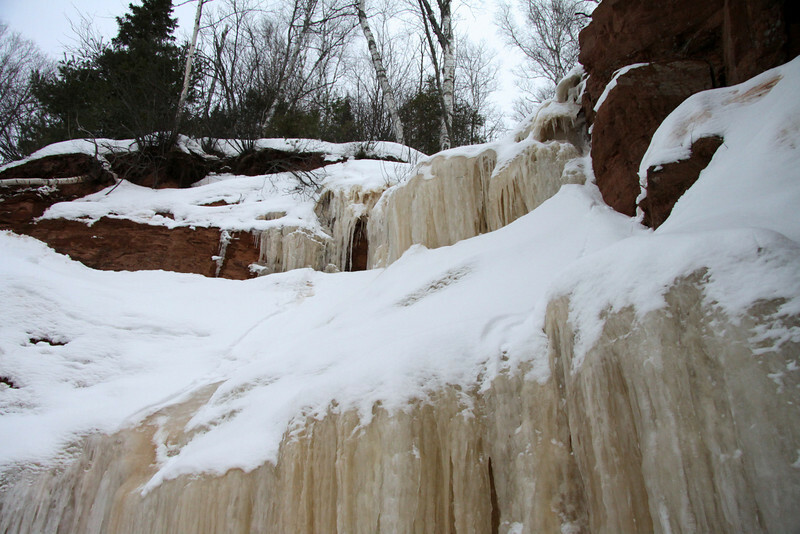 Up a mid-winter season waterfall, revealing the iron oxide mineral content once suspended in solution during the fall season's last water flow - with a fallen aspen along the upper sandstone ledge.